Kareena Kapoor's religious gymming appears to have paid off - the 37-year-old actress looks a lot like her size zero self from a few years ago - and people aren't entirely impressed. Kareena, who gave birth to son Taimur in December 2016, recently walked the ramp for her "favourite" designer Manish Malhotra in Singapore and a behind-the-scenes moment from the show, featuring Kareena and best friend Amrita Arora, has been flooded with vile comments on Instagram. 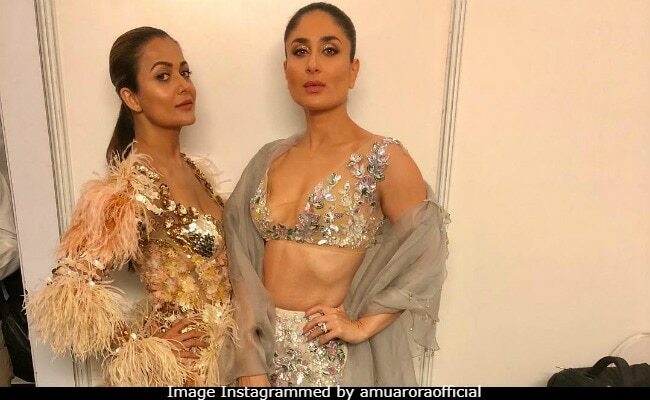 Kareena, who was dressed in a Manish Malhotra ensemble - an embellished bralet and lehenga, was trolled for looking "too skinny" and was asked to start eating and gain weight. "Kuchh kha liya karo," she was told. The trolls also added that she resembles a "skeleton" because of her toned midriff. "Seems like Kareena underwent some treatment to look skinny," read one of the comments while another speculated that Kareena might be suffering from malnutrition. "What happened to Kareena? She looks like a skull," wrote another follower in the comment's section. Some also said that the actress looked older than her age: "Amrita looks fab and you look aged." Kareena Kapoor has been frequently photographed hitting the gym in the last year and shed her post-pregnancy weight within months. Her strict work-out regime allowed her to resume work commitments - she returned to filming Veere Di Wedding after a short maternity leave. In 2008, Kareena made headlines for becoming a "size zero" for Tashan. Kareena, who reportedly starved herself before shooting a beach sequence in a bikini, fainted on the sets of the film. Those who remember, Deepika Padukone was subjected to similar trolling after her photoshoot for the jewellery edition of Vanity Fair UK in July last year. "Dead body" to "anorexic" are some of the adjectives she was referred to with. She was also told to "eat a burger." Kareena Kapoor will next be seen in Shashanka Ghosh's Veere Di Wedding, which also stars Sonam Kapoor and Swara Bhasker.